You are here: Home / Everything / Apple / USB Ethernet Not Working in macOS 10.12 Sierra? USB Ethernet Not Working in macOS 10.12 Sierra? It’s become routine: Each new update of Mac OS X macOS breaks third-party drivers and applications. 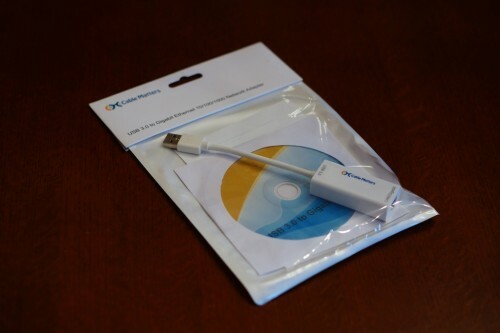 This time it’s many popular third-party USB 3.0 Gigabit Ethernet adapters that don’t work. But have no fear! It’s a simple fix! I’ve got a few different USB 3.0 Gigabit Ethernet dongles: One from Cable Matters (from Amazon) and another by j5 Create (from Best Buy). Both are essentially identical, though, being based on the AX88179 chipset from Asix of Taiwan. Since this chipset is not supported “out of box” by Mac OS X or macOS, it’s necessary to install a driver to get it working. And upgrading to macOS 10.12 “Sierra” unsurprisingly kills this driver. The simple solution: Reinstall the driver! As is typical with devices like this, it’s best to install the basic driver from the chipset company rather than the specialized drivers from the device company. So rather than trying to chase down Cable Matters or j5 Create, just head to Asix.co.tw and download the AX88179 driver from there. I installed version 2.8.0 from Asix and everything is hunky-dory again. It’s funny: There are threads on the Apple Support forums with people crying that these devices aren’t working, and lots of horrible/useless suggestions to fix them. But just reinstalling the driver works fine!